The Restoration Party Logo and symbol (℞) – we have the prescription for America’s healing. 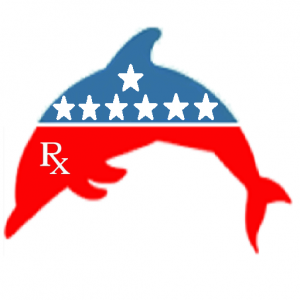 The Restoration Party has the dolphin as its mascot and the Rx symbol (℞) as its letter. The Restoration Party is both conservative and liberal. We believe in sufficient regulation on the one hand to protect the environment and the common good, but limited government for the sake of fiscal responsibility. Our central purpose is the restoration of government back to the service of the people, government of, for and by the people and restoration to sanity. On issues between conservatives and liberals we listen to all sides. We are lobby independent. The Neutral Tax – turns all revenue generation over to the states and eliminates the 74,000 pages of IRS tax code. The states send a check to the Federal government for its services. Red states can have red solutions such as Reaganomics and blue states blue solutions like Keynesianomics if they choose. Each state will be unhindered by the changing of US presidents every four years. They will compete with each other to be the most favorable states to live in. The Neutral Tax is consistent with the philosophy of government that is by the people because it gives the states the ability to decide what is best. Neutral Health – there are many ways to improve the quality and reduce the cost of health care while ensuring that all citizens have coverage, especially the most vulnerable. Neutral Health lets each state make the decision as to what will work best within its own context and according to the opinion of its own voter base. Each state competes with other states on both health and taxation. Term Limits for Congress – we support a six year term limit for Congress members. Congress will not vote itself out of office so we will seek the second option of the fifth amendment for this and other measures to reduce term limits to six years. That way Congress won’t be campaigning while in office and their sole function will be to serve the public as they were elected to do. Anti-Corruption Acts – we will fight for the end of corruption in government. We will support an abridged American Anti-Corruption Act that is consistent with our Neutral Tax plan, implemented locally by state. It will eliminate the revolving door of hiring Congress members whose terms end for the lobbies they have helped. It will seek out the original intentions of the 1974 FEC laws and close loopholes for SuperPACs, PACs and lobby bundlers. It will seek to assist small donors and independents to have an equal voice in government. In this way government will be restored as a service to the people, of the people, by the people and for the people. The Equality of Influence Act – we will seek to break up the media monopolies through state initiated tax laws that generate subsidies for smaller media company start ups and independent voices in order to restore journalism to its original function of service to the people rather than service to the political parties and elites who own and secretively rule them. The American Prosperity Act – we will call for an immediate freeze on cost of living adjustments (COLA) for all government employees including Congress until such a time as the average and median wage of the private sector is equal to or greater than that of the public sector average and median wage. This includes benefits. This act will force the government to make America prosperous again and serve the people they are hired to serve rather than themselves. The Fiscal Responsibility Act – we will call for the ever-growing national debt, now at almost twenty trillion dollars to be paid off. America has not yet made the first mortgage payment on this debt. It is misleading not to include payment on this debt to our expense sheet in our government accounting. At zero percent interest a 30 year loan repayment is more than $600 Billion annually when amortized. At 3% the figure rises to over one trillion dollars annually. These figures need to be added to our annual budget on the expense side and never ignored again. Annual budgets must also be balanced. Working together with the Neutral Tax, each state must pay off their corresponding portion of this debt until it is paid in full. Fiscal responsibility will make America prosperous again by strengthening the US dollar, lowering the rate of inflation and increasing employment. The Better Voting Systems Act – We will advocate for better voting machines and processes so that elections can’t be rigged in the future. We will eliminate gerrymandering through a call to geographic, rather than geopolitical boundary making. We will call for range voting to replace plurality voting so that voters no longer have to choose between the least of two evils. We will seek to overturn the electoral counting system so that there is no longer a winner takes all system in elections. We will do this so that we can be represented by our government fairly, understanding that the two party system has neither represented us nor produced anything but tyranny for the American people. The Military Repentance Act – the purpose of the American military is defense domestic and abroad. As a superpower we have confused our economic interests with our geopolitical interests and we have cultivated enemies by meddling in regime changes. We must resist military engagement even when there is just cause except where America’s defenses are at risk. The Military Repentance Act is a comprehensive act that recognizes that America’s military and policing role both at home and abroad has not always had good results. Reparations are appropriate in many cases. Sincere apologies are called for. We need to admit that we have not been perfect and commit ourselves to service and healthy alliances that are not strictly for financial gain, as they often have been in the past. The Act will forbid the sale of weapons to any foreign government or private entity. The Act will also demand the permanent financial assistance of our veterans, especially those who are wounded, and their families as we owe a great debt of gratitude for their sacrifice for our country. America will only be great again through repentance. We have blood on our hands. Our government has been self-serving. We need to be restored to a right relationship with our own people and with the world. It is simply the right thing to do. It is simply the right way to govern with justice. Being restored to fiscal responsibility, we will do what is good and right and create a better world. These are the core values of the Restoration Party as outlined in the Restoration Party Manifesto. As I pledge my allegiance to the Restoration Party, I express my commitment to work to restore government to the people, for the people and by the people of America and to seek out and support representatives, policies and legislation locally and nationally to that end. I affirm that government must be limited in size so that it does not create a burden of debt and that its purpose is to serve the people rather than use them. I am proud to be an American not because America’s past is fully honorable but because I hold a vision for a future America that humbly progresses toward a better, more peaceful world, where hunger and homelessness are eliminated, where healthcare is affordable and available for all, where equality of rights and dignity is not just legislated but apparent in relationships, where our environment is preserved responsibly for future generations, where abundance is measured in terms of quality of life for all and not just the few, and where freedom exists in a balance for the common good and every citizen has a voice. To that end I will seek to break up media monopolies and end the two party system through every reform necessary while putting an end to voter fraud. I will no longer allow America to be a corporatocracy, aristocracy, oligarchy or plutocracy. I will seek term limits for Congress and to end systemic corruption so there is no advantage to career politics. I will demand that our government both live within its means and pay off its debts until it owes nothing. I will respect the separation of church and state and the freedom of speech and thought, while cherishing worthy values. I recognize that our past and present is in many ways dysfunctional and I will seek to restore our nation to sanity and to move step by step towards maximized awesomeness.